My first time entering and I was extremely pleased to have all four of my entries accepted...and even more pleased when Hold It Together won 2nd Place. It is a wonderful show, a fantastic Gallery and they do a spectacular job of supporting the arts in a myriad of ways. I will be having a show the last two months of 2017 at the Gallery and have invited a few select artist friends to join me. Watch for more info. So honored to be selected for this award! The competition at this top notch event is tough as there are many, many stellar artists in the show. The show has now been renamed and is now the Carrollton Festival of Arts. It is one of my absolute favorite shows and will always hold a spot of honor in my line up. If you are anywhere near the Carrollton, GA area you need to go to the show in October. This is the top award for that category. I was thrilled to get the award! This is another show where artists are treated well and the people that come are great. They care deeply about the arts and always have a nice line up of arts and events at the show. It is Mothers Day weekend every year. Piece selected for the permanent collection at the Carrollton Cultural Arts Center. I was pleased, very pleased, when Silence of the Truth was selected for purchase by the Carrollton Cultural Arts Center for their permanent collection. A photo of the piece is included in the slide show to the left and below. This was my first year doing the Spring show. I had a great time and many of my pieces found new homes. I look forward to doing the show again. The award was given because I love the folks who put on th e show and do what I can to help promote the show. I was honored to selected by the Directors of the show to receive this award. Isn't it a beautiful ribbon? I looked a bit ragged --- it was HOT. II was honored to have Treading Water chosen as one of the top ten in the show! Over 65 artists showed up to three pieces each so the competition was talented. The exhibit was held at the Centre for Performing and Visual Arts in Coweta County. It's a beautiful venue. 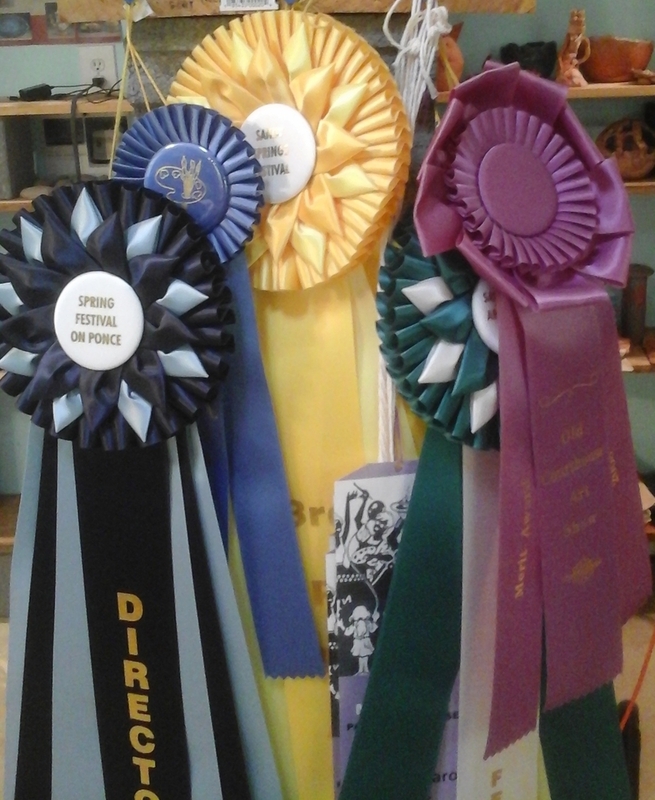 It was great to be awarded third place at the show! It was a large show, over 230 booths on the Art Walk with even more in the Business/Civic area & other sections. Lots to do for the entire family along with booths chocked full of outstanding art. You may have to look hard to see the face due to the quality of the photo, but it's there! The colors and the lighting may make it difficult to see the depth. I had a great time at the annual Courthouse Square Art Show in Fayetteville! Thanks to all who bought my art! My work won a ribbon . 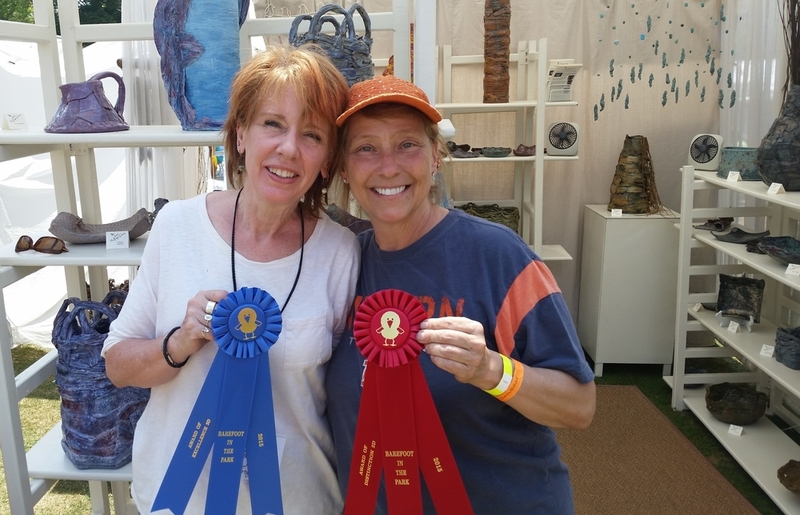 It was great to do the show and really fantastic to have the judges appreciate my pottery, too. I have had articles written about my art in the Atlanta Journal Constitution, The Citizen Newspaper and other regional newspapers. The links have expired sadly and the AJC asked for my first-born along with all the money it would take to raise him for the rights to the story so I don't have it. A photo of my art was chosen by the Marietta newspaper to highlight happenings at Marietta Art in the Park (I have physical copies, no links).